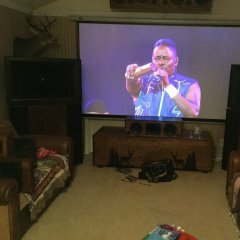 Back in the day, when JBL did this thing called a "tent sale" that a bunch of us took advantage of around here, I found my home theater sub solution: a pair of the beastly 4638 twin 15" cabs, and paired them with a makeshift EQ solution: The Behringer "Feedback Destroyer", which had a section that could (and that I did) use as a sub EQ. Got a test tone disc, SPL meter, and used a webpage that very succinctly - step by step - so even an idiot like me could do it - allowed me to set up a parametric EQ to tame and shape those beastly cabinets into one beeeeeuuuuutiful sounding rig.....with a really nice "house curve" taboot. I kept the printouts of the online manual and the settings, just in case - or so I thought. Because after about 8-10 years, the EQ had some sort of "oops" which lost the memory of the settings within - and sans that old reference material are back to square one - a pair of outta control beasts as they were the day they arrived here. I can't for the life of me find those notes, so I'm thinking what of possibly better and easier solutions. The BFD unit worked wonders, but without those reference materials couldn't get another one set up even if I tried. So I ask: Are there any parametric style or other sub EQ solutions that I might use as an updated "sub"-stitute? I've read that stuff exists like "Audessy" and similar in preamps, and I suppose if it took buying a "newer" but probably now "vintage" HT preamp to get a solution that's not impossible to set up and get results from I would consider that too. 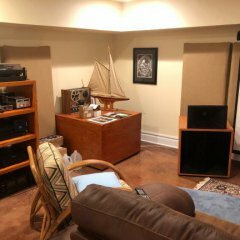 I'm still using a Krell Home Theater Standard from circa 2002 or so.....and aside from this problem have no reason to replace it.....but I do figure if I'm in search of a solution for this problem and such a solution exists in say a fiveish year old HT pre that I can get a deal on, that might be an option too. Check out the 'Mini-DSP'. It does a lot. I use one for my subs and it works great. With a cursory look of those pages, it appears to have some serious possibilities. I doubt I'll apply EQ to thew entire spectrum (just sub) but like what I see. Basically need a low pass with parametric and seems this might well be an option. I'll await any other comments, as it will be a few weeks if not longer before making a move here but like what I see as a cursory look. I need a mic setup to measure the room response too, and will comb through this more soon. It worked wonders with my horn loaded subs. I use a DEQ2496 to EQ my mains and love it. So did the responders here just get the basic version? Also did anyone use this for a total system EQ or just for the subwoofers only? Did anyone buy the microphone and have the software program the EQ? You definitely want a measurement mic and then you download freeware REW which takes the measurements and is pretty easy. I use several amps for mains, mbms and subs. They all have peq capability which i find to help in all cases. But the sub eq is critical and really the key element to fixing room issues. Even if you dont use peq, the crossovers, delay, gain, dynamic eq and other functions all have some potential benefit. A minidsp for the subs is a great start. I am using a MiniDSP (4x10hd in my case). I also use the Umik-1 measurement mic. It is very easy to set up and use. Getting the right settings, however, can take time. Bass response varies throughout the room, so taking measurements in the right places and applying the right EQ can take some trial and error. This will be true for any EQ though, as I am sure you know. I can recommend the MiniDSP products highly. They work as advertised, are easy and straightforward to use, and are affordable. I have not compared sound quality to other EQ or active crossover products, but it sounds good to me. Certainly a lot better than my old non EQ'ed, passive crossover setup. I can recommend the MiniDSP products highly. So did the responders here just get the basic version? Really need to get the HD version, the normal version clips too easily, Mark Seaton of Seaton Sound has claimed that the normal ones clip as soon as only half a volt. Also did anyone use this for a total system EQ or just for the subwoofers only? My guys that are using a DSP for a total system solution ends up going with Xilica, I'd look into those but yeah they're more expensive. I’m really only looking at this as subs only I think. Will the HD version work OK with a pro. amp or do I need a different amp? I’ve had some tell me to get the balanced version. Every group/ forum I talk to gives me different answers on this without much detail. I've been using mine for over a year now......subs only, with a pro-amp either a Crown K2 or a Behringer EP4000. I use RCA-XLR cables and it works perfectly. Oh, and mine is the HD version (2X4). Dayton makes plate amplifiers with built in DSP if you are only interested in EQ for the sub(s), they offer built in high pass for the mains as well.